Life can never be a bed of roses, at all times. But, a positive outlook and the ability to meander through hardships allows a person to create a full and vibrant existence. We confronted this simple yet meaningful fact of life when we met Basamma H., an Akshaya Patra beneficiary from Raichur, Karnataka. 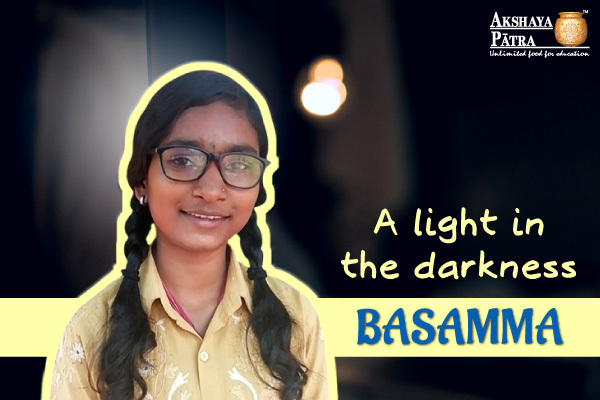 Basamma is currently pursuing Science in Junior College. She hails from a family of five where her parents work as coolies and supports the family with their daily earnings. Her younger brother and sister are studying in Standard 9 and 10 respectively. They do not even have the basic facility of electricity and thus depend on lamp light for studying. Basamma’s father is always on pins and needles in order to get the children educated and see them prosper in life. Despite these challenging conditions, Basamma’s intense desire to learn was reflected in her commendable score of 88% in 10th Board Exams. Basamma’s favourite teacher at school was Smt. Chandrakala, who taught her Maths and had made it one of her favourite subjects. At her Junior College, she has taken Physics-Chemistry-Mathematics as her subjects, and aspires to do B.Sc in Agriculture. Her hobbies include gardening and reading books with her best-loved book as ‘Annanehapu’ by Poornchandra Tejasvi. Akshaya Patra’s meals are very popular among all the students in her college, and she loves it too. As it is said, hard work always pays off, and that is clearly seen in the case of Basamma. We wish her all the luck and extend our support in reaching her dreams.